The development of a system is co-produced (or co-caused) by co-factors inherent in the system itself, as well as by co-factors from its outer and inner environment. Likewise, problems within and across systems are co-produced. Systems thinking emphasises that there is no single causation but that everything (e.g. every “thing”, system, issue and problem) is the result of multiple causation arising from various co-producers. Note: Co-producers are systems that contribute mei (matter, energy and information). They are stakeholders of the system and their contributions are referred to as co-factors. The terms co-causation, multiple causation and co-production can be interchanged. Biomatrix theory emphasises that co-production arises from three levels: the system itself (including its various parts), as well as from systems in the outer and inner environment. For example, a person’s life is co-produced by him or herself (e.g. mental and emotional constitution and effort), by the state of the organism, cellular functioning and genetic predisposition of the inner environment, as well as by external circumstances. 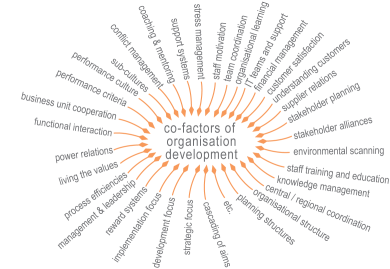 Likewise, an organisation is co-produced by the organisational self (e.g. its ethos, aims, structures and support systems), the contributions of its staff members (inner environment) and its external environment (e.g. market developments, stakeholder contributions, societal and planetary conditions). The co-factors influence the development of the system, including its behaviour, the resources it has available and the outcomes it achieves. This development can be desirable or undesirable. Undesirable development is associated with problems. One cannot understand a system, issue or problem, unless one understands its co-factors. Single cause thinking is a major co-factor in a change manager’s failure to understand and solve complex problems and generate a more desirable development for the system they want to change. By asking “What else co-produces the development or problem?” one shifts automatically into systems thinking mode. what is the relevance of this concept for you?